Fortunately, I was able to interview Mr. Parker and I found out that he was also here to establish a link between the University of Lancashire, Debrecen University and maybe even Partium University. Until now the University of Central Lancashire has developed research links with literature departments in Charles University Prague, the University of Łódź , Debrecen University and the University of Ulster. Mr. Parker has been a member of the faculty at the University of Central Lancashire since 1999. He teaches Romantic literature to 2nd and 3rd year students and runs the 2nd year core modules in Literary Theory, and offers option modules in contemporary Irish drama, poetry and fiction, colonial/ post-colonial literatures and the writings of Thomas Hardy. His principal areas of research lie in Irish Literature (particularly the literature of the Northern Ireland Troubles), contemporary British literature and post-colonial writing. He published also several writings like: Seamus Heaney: The Making Of The Poet, Macmillan, 1993; The Hurt World: Short Fiction Of The Troubles, (editor) Blackstaff Press, 1995; Postcolonial Literatures: A New Casebook (Achebe, Desai, Ngugi, Walcott), (co-edited with Roger Starkey), Macmillan,1995; Contemporary Irish Fiction: Themes, Tropes, Theories (co-edited with Liam Harte), Macmillan, 2000; Northern Irish Literature, 1956-2006: The Imprint of History (two volumes), Palgrave Macmillan, September 2007. Besides having written these books he held a very interesting and useful presentation about Northern Ireland: Discovering its Political Contexts and its Literature. It was helpful in furthering our knowledge of the Irish- English conflicts. He presented the political points of view through literature using Seamus Heany’s “Limbo”, Allan Gillis’s “Progress” and Brian Friel’s play Translations. It is interesting to note that he was born in England and is a real Englishman. 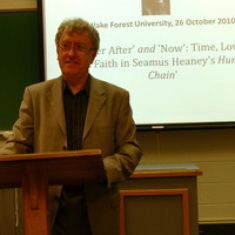 He became interested in Irish culture, literature and history after reading Seamus Heany’s poetry. He was so kind as to offer his help to those students who are interested in Irish issues, so here is his e-mail address: mrparker@uclan.ac.uk. I can suggest to those who are interested and would like to write to him should not be afraid. He said that he might reply late, but he will do it anyway. I think our University is becoming lucky to have visitors Sharon Pollock, the Canadian Dramatist and also Mr. Parker, of course. It is a great honor to meet famous people like them. Being visitors of our university this gives us the opportunity to be acquainted with brilliant people. Famous People at Our University!! !